It's finally happening. Casey Criswell, the man of many podcasts, is joining Derek for an episode of Monster Kid Radio. The movie on deck? 1966's Daleks - Invasion Earth: 2150 A. D. (dir. Gordon Flemyng). Derek makes the shocking admission that he's never seen an episode of any incarnation of Doctor Who (even though he's had friends over the years give him DVDs of Who to watch! ), Casey makes a few jokes, and together, they may just succeed in defeating the Daleks. Or, at least, this movie's version of the Daleks. Casey breaks down the main differences between the Who-isms in the film and the television series. The Green Slime (dir. Kinji Fukasaku) is HERE . . . and so is The Shadow Over Portland's Chris McMillan and The Polier Graveyard's Jeff Polier. Chris and Jeff join Derek to discuss more of their thoughts of this 1968 gem. Along the way, Michael Bay comes up (more than once), and Jeff tells us what he thinks of the movie Monster Kid Radio is tackling next week with Casey Criswell. 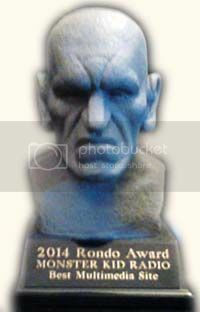 You'll get all this, plus a listener voicemail in episode #230 of the Rondo-award winning Monster Kid Radio! While Derek is headed to a panel planning meeting for the 1st Annual Living Dead Horror Convention, he takes the time to discuss the 1968 favorite The Green Slime (dir. Kinji Fukasaku) with The Shadow Over Portland's Chris McMillan and The Polier Graveyard's Jeff Polier. This movie was a childhood favorite of this week's guest, and Derek can't wait to talk about the movie with them. 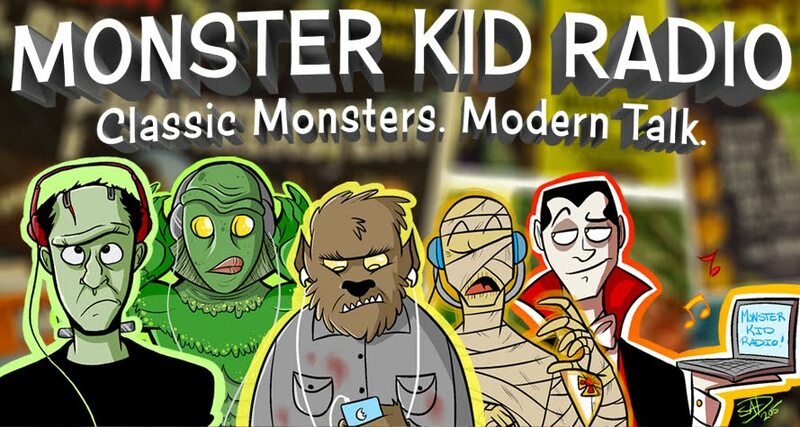 Also, Monster Kid Radio received a voicemail from MKR regular Stephen D. Sullivan. Open the door, you’ll find the secret. To find the answer is to keep it. This week, when Nicholas Hatcher wasn't rocking it on his own podcasts - Vampire Over Hollywood and Psychotronic Celluloid - he came by Monster Kid Radio to talk about the 1942 film The Mummy's Tomb (dir. Harold Young) with Derek. Along the way, Derek reveals what may be one of the reasons he loves mummy movies so much, and both he and Nicholas praise an actor who may not have been too happy in this movie but delivered anyway! You just kind of have to say, "Well, let's just watch the movie!" Nicholas Hatcher returns to the podcast for Monster Kid Radio's continued exploration of Universal's 1940s mummy films. This time, the two podcasters briefly share their thoughts on what this particular decade-in-horror looked like for Universal while discussing 1942's The Mummy's Tomb (dir. Harold Young). Also, some new guests have been announced fore the Living Dead Horror Convention, and monster kids are going to love to meet THESE munster kids! Derek takes the listeners behind the scenes for a look at what life is like for this podcast-producing, monster-movie-loving monster kid. Last summer, something happened that changed Derek's life. He attended his first Monster Bash. The convention was first started in 1997 by Ron Adams, and this week on Monster Kid Radio, Ron joins Derek to talk about the origin of the show, his own background as a monster kid, and what future Monster Bashes hold. Be sure to visit our complete website at http://www.monsterkidradio.net, and don't forget our Wiki Campaign! You have to sleep sometime, and that mummy's still coming. What's better than a movie with a monster in it? A movie with TWO monsters it! Or THREE! Or MORE! Joe DeMuro (director of the monster mash up movie Tales of Dracula) joins Derek to talk about their favorite monster mash up films. They break down their individual top three monster movie meet ups. Also, there's an event happening in Portland next week you might want to check out (LUCHA!). Director Joe DeMuro returns to Monster Kid Radio to discuss how his movie Tales of Dracula played at this past summer's Monster Bash. What was the crowd reaction? How were sales for the weekend? And the behind-the-scenes stories about the production? Fascinating. Joe and Derek discuss what it was like for Wolfbain Productions to produce this film guerilla-style, how they overcame certain obstacles, and what may happen with a sequel (or two!). Plus, Derek announces July's Executive Producer roll call! "It was kind of like being a junkie. I needed more monster movies!"